In the May issue: President’s Message, New Members, Induction Ceremony and Recognitions, Club Special Sight Award and Recognitions, Recognition Night, Club Calendar – Save the Dates, Installation Night Information, Golf Committee, Fishing Derby, Math Pride Challenge, Centennial Celebration Information, Six Word Stories, In Memoriam, and Memorial Day Reflection. In the March-April issue: President’s Message-March, President’s Message-April, Lions Code of Ethics, Installation Night – Slate of Officers, State Convention – Matt Soeldner, Club Calendar, Fishing Derby, Math Challenge, Six Words Stories, and State Convention Info and Forms. 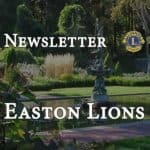 In the February issue: President’s Message, New Members & Recognitions, Message from Jon Morgan, The Auction – Old News but Good News, Haiti Project supported by Lions Thrift Store, Smith Farm at Borderland Legacy Project, Save the Dates, Eyes on the Web-EastonLions.org has a New Look. In the January issue: President’s Message, Club Calendar, Rockery Clean-up Retrospective, Santa for Seniors, Residence at Five Corners Help on Santa for Senior, BAArc Christmas Party, Holiday Festival & Talent Show Recaps, Lions Pride Math Challenge, Cheers! Visiting another Club, Holiday Festival History, Human Rights Committee in Easton, Lions Thrift Shop, Lions 2016-2017 Officers, Mid-Winter Conference District 33-S Info, Save the Date, Thanks to Our Sponsor, Queen of Hearts. 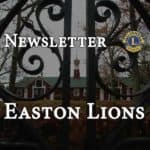 This is a special 2016 year-end newsletter issue which includes the President’s End of Year Message, Donation Summary, Events in 2016, In Memory of our Departed Lions, Lions Honored, Social Media Activity. Newsletter September 27, 2016 – Volume 21, Issue 2Special Anniversary Edition Download PDF Newsletter-201609-Special-85th In this issue: President’s Message, And So…We Began to Serve: 1931-1945, Congratulatory Notes, Lions 2016-2017 Officers, Golf Tournament a Great Success, Club Calendar, Thanks to Our Sponsor, Queen of Hearts. Newsletter June 16, 2016 – Volume 20, Issue 6 Download PDF Newsletter-201606 In this issue: President Elect’s Message, Photos from Installation Night, Ann Lawrence $10,000 Bequest, Jeff Aldrich Toolship, Fund Screening Annual Recap, Melvin Jones Fellows, Scholarship Recipients, 85th Anniversary Plans, Thrift Store’s Successful Year, Save the Date, Queen of Hearts, Thanks to Our Sponsor. Newsletter April 26, 2016 – Volume 20, Issue 5 Download PDF Newsletter-201604 In this issue: President Elect’s Message, 2016 Auction, Grant Report, District Happenings, Golf Tournament, State Convention Form, Club Officers 2016-2017, Queen of Hearts, Thanks to Our Sponsor.